"We recently discovered a discrepancy between the definition of Average Duration of Video Viewed and its calculation. We had previously *defined* the Average Duration of Video Viewed as "total time spent watching a video divided by the total number of people who have played the video." But we erroneously had *calculated* the Average Duration of Video Viewed as "the total time spent watching a video divided by *only* the number of people who have viewed a video for three or more seconds." So, in essence, Facebook's average duration viewed numbers have been inflated by them excluding views of less than three seconds from the count. What sort of impact that has is hard to say - according to The Wall Street Journal, Facebook had told ad buying agency Publicis Media that the mistake saw average video view time stats inflated by between 60% and 80%. That would be significant, but at the same time, other marketers have played down it's importance. "If someone didn't watch for at least three seconds, it's an accidental view and shouldn't be counted." The issue has also once again raised questions about what should and shouldn't count as a meaningful video view - for clarification, here's a comparison of how the major platforms currently register a video view. As you can see, there's a big discrepancy between how video views are logged, which has long been a source of debate in itself, and as such, any query over the accuracy of video metrics once again raises questions about how the system operates. In fairness, Facebook's owned up to the mistake - as noted, the issue was highlighted a month ago on the Facebook forum. In addition, Facebook has published an official apology for the error and assured advertisers that the error had not caused any flow through impacts on ad billing. "We want our clients to know that this miscalculation has not and will not going forward have an impact on billing or how media mix models value their Facebook video investments." Facebook's also been working to provide more transparency in their video metrics over time, adding independent verification from Nielsen, comScore, Integral Ad Science and Moat so advertisers can be assured that the data is correct and not being unfairly re-framed by Facebook. Given all of this, it seems fairly evident that the mistake was not a deliberate error, and that Facebook is doing all it can to provide accurate, relevant video statistics. The issue really comes down to what measurements brands are watching. Of course, average view time is important - if you were to be building out your video strategy based on the metrics available, you'd be looking to double down on those video that had higher average view rates. But even with this error in play, such an approach would still likely be effective - the average view time shown wouldn't reflect those that switched off after less than three seconds, but as noted by Parse.ly, those viewers were likely not engaged anyway. Therefore, if you were to have optimized your video content based on the metric as it had been listed, you'd be focusing on the videos that were producing better results either way. The numbers might have been inaccurate, but because all of them were subject to the same measurement baseline, the comparison would still have been relevant - i.e. a video with a higher average completion rate was still performing better, regardless. "On one hand we expect the numbers to be accurate, we need the numbers to be accurate. And Facebook, for the sake of perception and trusworthiness, needs the numbers to be accurate. That said most advertisers see reach and view time as secondary or even tertiary metrics. When determining whether something is working, we typically focus on actions like clicks or conversions." That's an important distinction - yes, view counts are definitely important, as is data accuracy, but if you're not driving the desired action anyway, those metrics carry less relevance. None of this helps Facebook, of course - the mere suggestion that Zuck and Co are artificially inflating their stats is enough to spur the naysayers onto their "told you so" soapboxes, fueling further negative perception that's already seen Facebook shares decline as a result. Those declines have been fairly minor, but it does underline the importance of clarification on such issues from Facebook, of the delicate balance The Social Network needs to maintain to uphold public confidence - particularly against a mainstream media that's generally not on their side. In essence, for marketers, Facebook's video metrics error is a mistake, and one that, overall, would likely have had little impact on their content process. But it's a mistake nonetheless, and it's important for Facebook to clarify and correct it, as they have done. Such errors also bring into question every other piece of data we get from The Social Network, but there's nothing to suggest any of the other information available is wrong or misplaced. 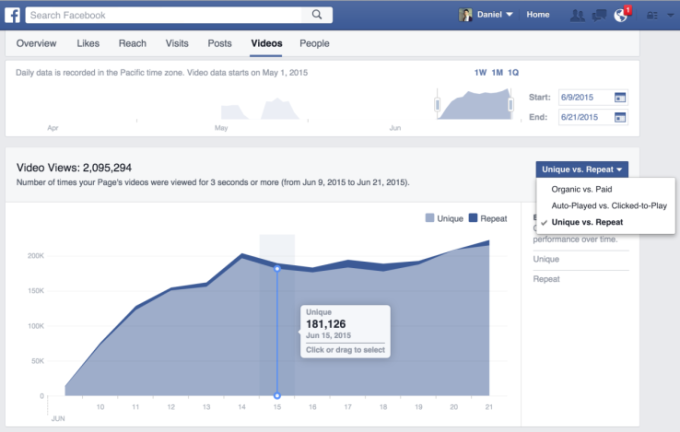 And the important thing for marketers to note is connection to the bottom line - are your Facebook, and other social platform efforts, helping boost the relevant stats aligned with your wider goals? Are you generating more click-throughs, more conversions, are you seeing more quantifiable interest in your products as a result of your social efforts? If you are, then great, you're doing social media marketing right. But if you're not, then it might be time to re-asses, regardless of what any on-platform stats might suggest.